Not to be confused with Aconitine. Illustration of pig aconitase in complex with the [Fe4S4] cluster. The protein is colored by secondary structure, and iron atoms are blue and the sulfur red. Aconitase (aconitate hydratase; EC 4.2.1.3) is an enzyme that catalyses the stereo-specific isomerization of citrate to isocitrate via cis-aconitate in the tricarboxylic acid cycle, a non-redox-active process. Aconitase, displayed in the structures in the right margin of this page, has two slightly different structures, depending on whether it is activated or inactivated. In the inactive form, its structure is divided into four domains. Counting from the N-terminus, only the first three of these domains are involved in close interactions with the [3Fe-4S] cluster, but the active site consists of residues from all four domains, including the larger C-terminal domain. The Fe-S cluster and a SO42− anion also reside in the active site. When the enzyme is activated, it gains an additional iron atom, creating a [4Fe-4S] cluster. However, the structure of the rest of the enzyme is nearly unchanged; the conserved atoms between the two forms are in essentially the same positions, up to a difference of 0.1 angstroms. In contrast with the majority of iron-sulfur proteins that function as electron carriers, the iron-sulfur cluster of aconitase reacts directly with an enzyme substrate. Aconitase has an active [Fe4S4]2+ cluster, which may convert to an inactive [Fe3S4]+ form. Three cysteine (Cys) residues have been shown to be ligands of the [Fe4S4] centre. In the active state, the labile iron ion of the [Fe4S4] cluster is not coordinated by Cys but by water molecules. The iron-responsive element-binding protein (IRE-BP) and 3-isopropylmalate dehydratase (α-isopropylmalate isomerase; EC 4.2.1.33), an enzyme catalysing the second step in the biosynthesis of leucine, are known aconitase homologues. Iron regulatory elements (IREs) constitute a family of 28-nucleotide, non-coding, stem-loop structures that regulate iron storage, heme synthesis and iron uptake. They also participate in ribosome binding and control the mRNA turnover (degradation). The specific regulator protein, the IRE-BP, binds to IREs in both 5' and 3' regions, but only to RNA in the apo form, without the Fe-S cluster. Expression of IRE-BP in cultured cells has revealed that the protein functions either as an active aconitase, when cells are iron-replete, or as an active RNA-binding protein, when cells are iron-depleted. Mutant IRE-BPs, in which any or all of the three Cys residues involved in Fe-S formation are replaced by serine, have no aconitase activity, but retain RNA-binding properties. Aconitase is inhibited by fluoroacetate, therefore fluoroacetate is poisonous. Fluoroacetate, in the citric acid cycle,can innocently enter as fluorocitrate. However, aconitase cannot bind this substrate and thus the citric acid cycle is halted. The iron sulfur cluster is highly sensitive to oxidation by superoxide. Aconitase employs a dehydration-hydration mechanism. The catalytic residues involved are His-101 and Ser-642. His-101 protonates the hydroxyl group on C3 of citrate, allowing it to leave as water, and Ser-642 concurrently abstracts the proton on C2, forming a double bond between C2 and C3, forming a cis-aconitate intermediate. At this point, the intermediate is rotated 180°. This rotation is referred to as a "flip." Because of this flip, the intermediate is said to move from a "citrate mode" to a "isocitrate mode." How exactly this flip occurs is debatable. One theory is that, in the rate-limiting step of the mechanism, the cis-aconitate is released from the enzyme, then reattached in the isocitrate mode to complete the reaction. This rate-liming step ensures that the right stereochemistry, specifically (2R,3S), is formed in the final product. Another hypothesis is that cis-aconitate stays bound to the enzyme while it flips from the citrate to the isocitrate mode. In either case, flipping cis-aconitate allows the dehydration and hydration steps to occur on opposite faces of the intermediate. Aconitase catalyzes trans elimination/addition of water, and the flip guarantees that the correct stereochemistry is formed in the product. To complete the reaction, the serine and histidine residues reverse their original catalytic actions: the histidine, now basic, abstracts a proton from water, priming it as a nucleophile to attack at C2, and the protonated serine is deprotonated by the cis-aconitate double bond to complete the hydration, producing isocitrate. ^ PDB: 7ACN​; Lauble, H.; Kennedy, M. C.; Beinert, H.; Stout, C. D. (1992). "Crystal structures of aconitase with isocitrate and nitroisocitrate bound". Biochemistry. 31 (10): 2735–48. doi:10.1021/bi00125a014. PMID 1547214. ^ PDB: 1ACO​; Lauble, H; Kennedy, MC; Beinert, H; Stout, CD (1994). "Crystal Structures of Aconitase with Trans-aconitate and Nitrocitrate Bound". Journal of Molecular Biology. 237 (4): 437–51. doi:10.1006/jmbi.1994.1246. PMID 8151704. ^ Beinert H, Kennedy MC (Dec 1993). "Aconitase, a two-faced protein: enzyme and iron regulatory factor". FASEB Journal. 7 (15): 1442–9. PMID 8262329. ^ Flint, Dennis H.; Allen, Ronda M. (1996). "Iron−Sulfur Proteins with Nonredox Functions". Chemical Reviews. 96 (7): 2315–34. doi:10.1021/cr950041r. ^ Beinert H, Kennedy MC, Stout CD (Nov 1996). "Aconitase as Ironminus signSulfur Protein, Enzyme, and Iron-Regulatory Protein". Chemical Reviews. 96 (7): 2335–2374. doi:10.1021/cr950040z. PMID 11848830. ^ a b c d Robbins AH, Stout CD (1989). "The structure of aconitase". Proteins. 5 (4): 289–312. doi:10.1002/prot.340050406. PMID 2798408. ^ a b c Robbins AH, Stout CD (May 1989). "Structure of activated aconitase: formation of the [4Fe-4S] cluster in the crystal". Proceedings of the National Academy of Sciences of the United States of America. 86 (10): 3639–43. doi:10.1073/pnas.86.10.3639. PMC 287193  . PMID 2726740. ^ Lauble H, Kennedy MC, Beinert H, Stout CD (Mar 1992). "Crystal structures of aconitase with isocitrate and nitroisocitrate bound". Biochemistry. 31 (10): 2735–48. doi:10.1021/bi00125a014. PMID 1547214. ^ Gardner, Paul R. (2002). "Aconitase: Sensitive target and measure of superoxide". Superoxide Dismutase. Methods in Enzymology. 349. pp. 9–23. doi:10.1016/S0076-6879(02)49317-2. ISBN 978-0-12-182252-1. ^ a b c d e f g h i Takusagawa F. "Chapter 16: Citric Acid Cycle" (PDF). Takusagawa’s Note. The University of Kansas. Archived from the original (PDF) on 2012-03-24. Retrieved 2011-07-10. ^ a b c Beinert H, Kennedy MC, Stout CD (Nov 1996). "Aconitase as Ironminus signSulfur Protein, Enzyme, and Iron-Regulatory Protein" (PDF). Chemical Reviews. 96 (7): 2335–2374. doi:10.1021/cr950040z. PMID 11848830. ^ a b PDB: 1C96​; Lloyd SJ, Lauble H, Prasad GS, Stout CD (December 1999). "The mechanism of aconitase: 1.8 A resolution crystal structure of the S642a:citrate complex". Protein Sci. 8 (12): 2655–62. doi:10.1110/ps.8.12.2655. PMC 2144235  . PMID 10631981. ^ Han D, Canali R, Garcia J, Aguilera R, Gallaher TK, Cadenas E (Sep 2005). "Sites and mechanisms of aconitase inactivation by peroxynitrite: modulation by citrate and glutathione". Biochemistry. 44 (36): 11986–96. doi:10.1021/bi0509393. PMID 16142896. ^ a b c Lauble H, Stout CD (May 1995). "Steric and conformational features of the aconitase mechanism". Proteins. 22 (1): 1–11. doi:10.1002/prot.340220102. PMID 7675781. ^ "Aconitase family". The Prosthetic groups and Metal Ions in Protein Active Sites Database Version 2.0. The University of Leeds. 1999-02-02. Archived from the original on 8 June 2011. Retrieved 2011-07-10. Frishman D, Hentze MW (Jul 1996). "Conservation of aconitase residues revealed by multiple sequence analysis. Implications for structure/function relationships". European Journal of Biochemistry / FEBS. 239 (1): 197–200. doi:10.1111/j.1432-1033.1996.0197u.x. PMID 8706708. Aconitase (aconitate hydratase; EC) is an iron-sulphur protein that contains a [4Fe-4S]-cluster and catalyses the interconversion of isocitrate and citrate via a cis-aconitate intermediate. Aconitase functions in both the TCA and glyoxylate cycles, however unlike the majority of iron-sulphur proteins that function as electron carriers, the [4Fe-4S]-cluster of aconitase reacts directly with an enzyme substrate. In eukaryotes there is a cytosolic form (cAcn) and a mitochondrial form (mAcn) of the enzyme. In bacteria there are also 2 forms, aconitase A (AcnA) and B (AcnB). Several aconitases are known to be multi-functional enzymes with a second non-catalytic, but essential function that arises when the cellular environment changes, such as when iron levels drop [PUBMED:10087914, PUBMED:15877277]. Eukaryotic cAcn and mAcn, and bacterial AcnA have the same domain organisation, consisting of three N-terminal alpha/beta/alpha domains, a linker region, followed by a C-terminal 'swivel' domain with a beta/beta/alpha structure (1-2-3-linker-4), although mAcn is small than cAcn. However, bacterial AcnB has a different organisation: it contains an N-terminal HEAT-like domain, followed by the 'swivel' domain, then the three alpha/beta/alpha domains (HEAT-4-1-2-3) [PUBMED:9020582]. Below is a description of some of the multi-functional activities associated with different aconitases. 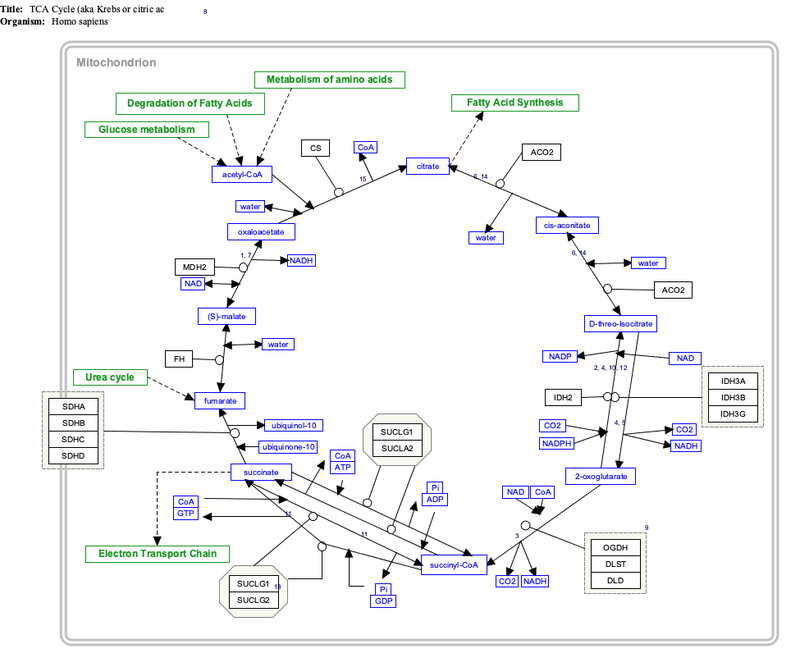 Eukaryotic mAcn catalyses the second step of the mitochondrial TCA cycle, which is important for energy production, providing high energy electrons in the form of NADH and FADH2 to the mitochondrial oxidative phosphorylation pathway [PUBMED:15543948]. The TCA cycle also provides precursors for haem and amino acid production. This enzyme has a second, non-catalytic but essential role in mitochondrial DNA (mtDNA) maintenance: mAcn acts to stabilise mtDNA, forming part of mtDNA protein-DNA complexes known as nucleoids. mAcn is thought to reversibly model nucleoids to directly influence mitochondrial gene expression in response to changes in the cellular environment. Therefore, mAcn can influence the expression of components of the oxidative phosphorylation pathway encoded in mtDNA. Eukaryotic cAcn enzyme balances the amount of citrate and isocitrate in the cytoplasm, which in turn creates a balance between the amount of NADPH generated from isocitrate by isocitrate dehydrogenase with the amount of acetyl-CoA generated from citrate by citrate lyase. Fatty acid synthesis requires both NADPH and acetyl-CoA, as do other metabolic processes, including the need for NADPH to combat oxidative stress. The enzymatic form of cAcn predominates when iron levels are normal, but if they drop sufficiently to cause the disassembly of the [4Fe-4S]-cluster, then cAcn undergoes a conformational change from a compact enzyme to a more open L-shaped protein known as iron regulatory protein 1 (IRP1; or IRE-binding protein 1, IREBP1) [PUBMED:17185597, PUBMED:16407072]. As IRP1, the catalytic site and the [4Fe-4S]-cluster are lost, and two new RNA-binding sites appear. IRP1 functions in the post-transcriptional regulation of genes involved in iron metabolism - it binds to mRNA iron-responsive elements (IRE), 30-nucleotide stem-loop structures at the 3' or 5' end of specific transcripts. Transcripts containing an IRE include ferritin L and H subunits (iron storage), transferrin (iron plasma chaperone), transferrin receptor (iron uptake into cells), ferroportin (iron exporter), mAcn, succinate dehydrogenase, erythroid aminolevulinic acid synthetase (tetrapyrrole biosynthesis), among others. If the IRE is in the 5'-UTR of the transcript (e.g. in ferritin mRNA), then IRP1-binding prevents its translation by blocking the transcript from binding to the ribosome. If the IRE is in the 3'-UTR of the transcript (e.g. transferrin receptor), then IRP1-binding protects it from endonuclease degradation, thereby prolonging the half-life of the transcript and enabling it to be translated [PUBMED:15604397]. IRP2 is another IRE-binding protein that binds to the same transcripts as IRP1. However, since IRP1 is predominantly in the enzymatic cAcn form, it is IRP2 that acts as the major metabolic regulator that maintains iron homeostasis [PUBMED:16850017]. Although IRP2 is homologous to IRP1, IRP2 lacks aconitase activity, and is known only to have a single function in the post-transcriptional regulation of iron metabolism genes [PUBMED:17513696]. In iron-replete cells, IRP2 activity is regulated primarily by iron-dependent degradation through the ubiquitin-proteasomal system. Bacterial AcnB is also known to be multi-functional. In addition to its role in the TCA cycle, AcnB was shown to be a post-transcriptional regulator of gene expression in Escherichia coli and Salmonella enterica [PUBMED:15882410, PUBMED:15009904]. In S. enterica, AcnB initiates a regulatory cascade controlling flagella biosynthesis through an interaction with the ftsH transcript, an alternative RNA polymerase sigma factor. This binding lowers the intracellular concentration of FtsH protease, which in turn enhances the amount of RNA polymerase sigma32 factor (normally degraded by FtsH protease), and sigma32 then increases the synthesis of chaperone DnaK, which in turn promotes the synthesis of the flagellar protein FliC. AcnB regulates the synthesis of other proteins as well, such as superoxide dismutase (SodA) and other enzymes involved in oxidative stress. 3-isopropylmalate dehydratase (or isopropylmalate isomerase; EC) catalyses the stereo-specific isomerisation of 2-isopropylmalate and 3-isopropylmalate, via the formation of 2-isopropylmaleate. This enzyme performs the second step in the biosynthesis of leucine, and is present in most prokaryotes and many fungal species. The prokaryotic enzyme is a heterodimer composed of a large (LeuC) and small (LeuD) subunit, while the fungal form is a monomeric enzyme. Both forms of isopropylmalate are related and are part of the larger aconitase family [PUBMED:9020582]. Aconitases are mostly monomeric proteins which share four domains in common and contain a single, labile [4Fe-4S] cluster. Three structural domains (1, 2 and 3) are tightly packed around the iron-sulphur cluster, while a fourth domain (4) forms a deep active-site cleft. The prokaryotic enzyme is encoded by two adjacent genes, leuC and leuD, corresponding to aconitase domains 1-3 and 4 respectively [PUBMED:1400210, PUBMED:9813279]. LeuC does not bind an iron-sulphur cluster. It is thought that some prokaryotic isopropylamalate dehydrogenases can also function as homoaconitase EC, converting cis-homoaconitate to homoisocitric acid in lysine biosynthesis [PUBMED:15522288]. Homoaconitase has been identified in higher fungi (mitochondria) and several archaea and one thermophilic species of bacteria, Thermus thermophilus [PUBMED:16524361]. It is also found in the higher plant Arabidopsis thaliana, where it is targeted to the chloroplast [PUBMED:20663849]. This entry represents a region containing 3 domains, each with a 3-layer alpha/beta/alpha topology. This region represents the [4Fe-4S] cluster-binding region found at the N-terminal of eukaryotic mAcn, cAcn/IPR1 and IRP2, and bacterial AcnA, but in the C-terminal of bacterial AcnB. This domain is also found in the large subunit of isopropylmalate dehydratase (LeuC). For those sequences which have a structure in the Protein DataBank, we use the mapping between UniProt, PDB and Pfam coordinate systems from the PDBe group, to allow us to map Pfam domains onto UniProt sequences and three-dimensional protein structures. The table below shows the structures on which the Aconitase domain has been found. There are 31 instances of this domain found in the PDB. Note that there may be multiple copies of the domain in a single PDB structure, since many structures contain multiple copies of the same protein sequence.